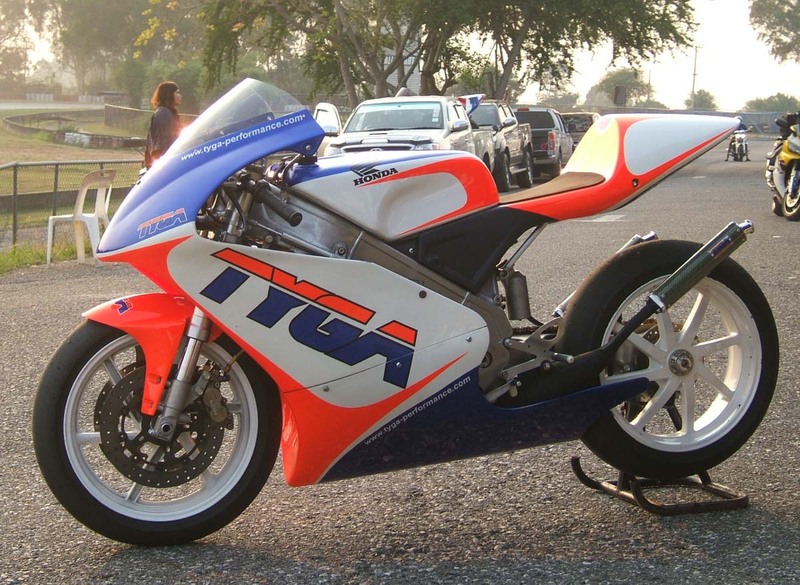 Being 250 two stroke fanatics, we are suckers for any that are for sale. We just can't help buying them whether we need them or not. 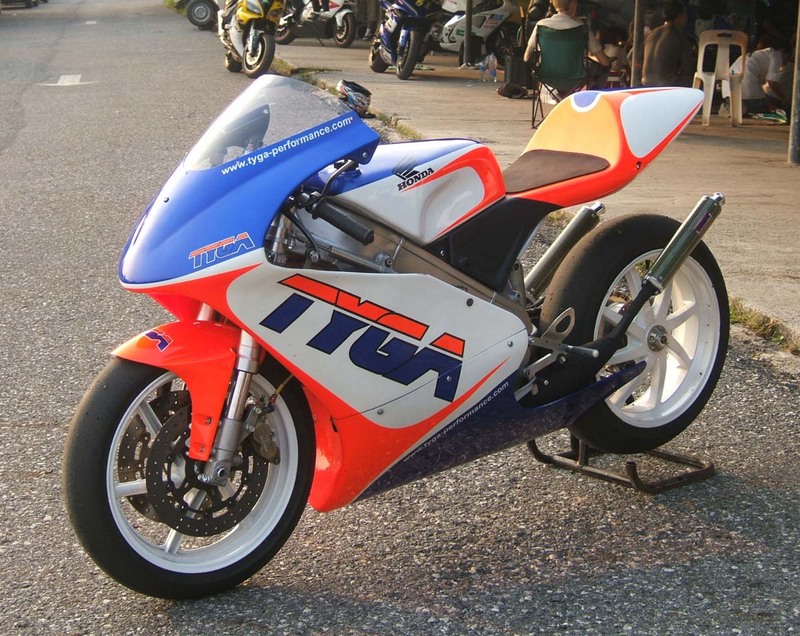 So when a couple years ago a shop in Bangkok had a beat up 1994 NX5 RS250 for sale we couldn't resist. 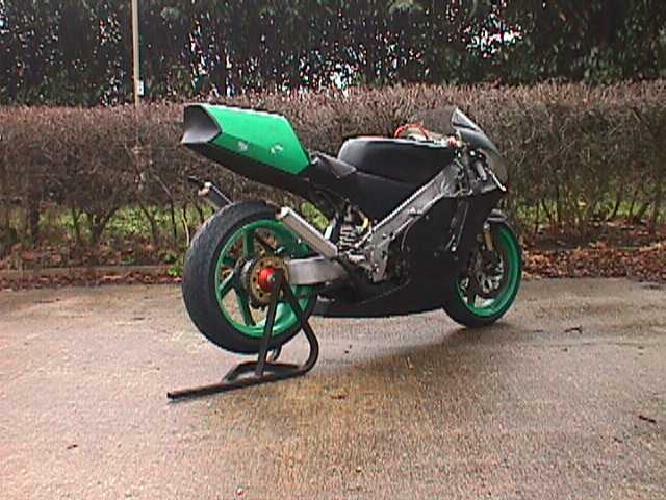 The reality was that we were far too busy to do anything with it and there was no racing class for it in the country so it sat in the race pit for over a year only having ever been started once. If this isn't daft enough, about a year later, the same shop had another NX5 for sale and this time for silly money. So we parted with hard earned cash again, ran the bike once, declared it good and this one sat in my bedroom because the rest of my house is already full of bikes (ten at last count in a two bedroom bungalow). 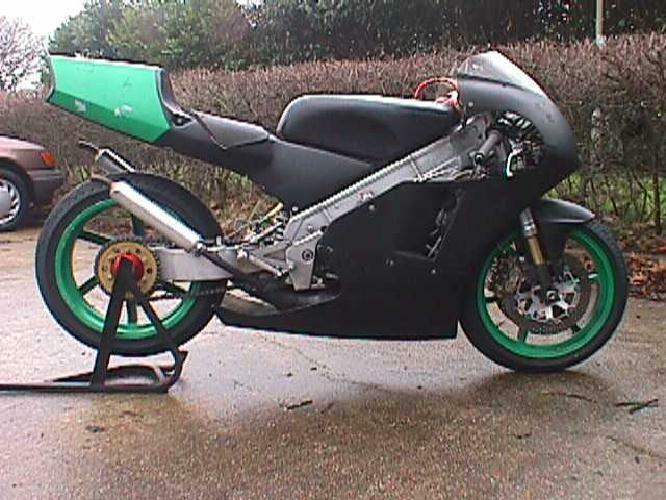 The plan was to make a nice track bike but I only ever got as far as stripping it down and borrowing various tasty components such as the front end for other projects. At least it took up less room so I could actually walk to my wardrobe in the morning without stumbling into footpegs and handlebars. This looked like a pattern was developing and could possibly end in either eviction from the house, bankruptcy or admission to an institution. Were we really going mad? Luckily for us, the track scene has picked up a notch or three. 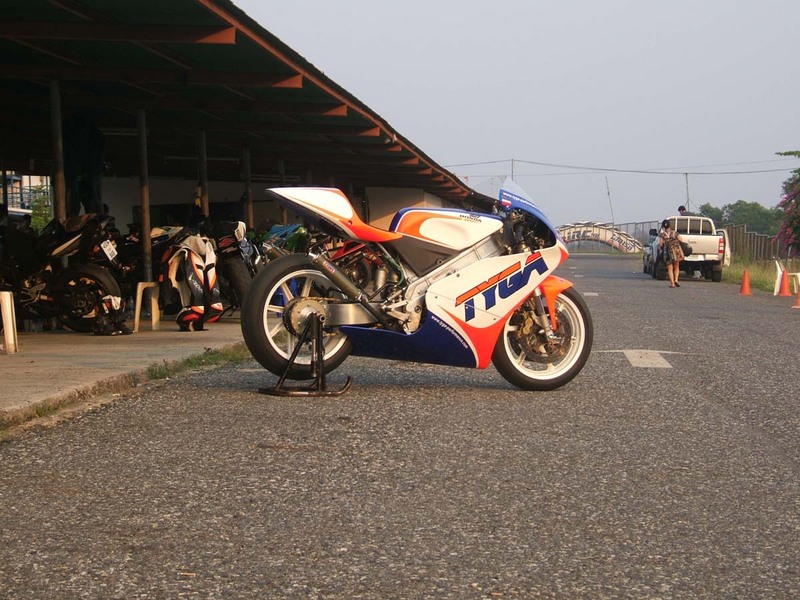 This year there are regular track days and very good participation with 50- 70 bikes so far at each even this year. 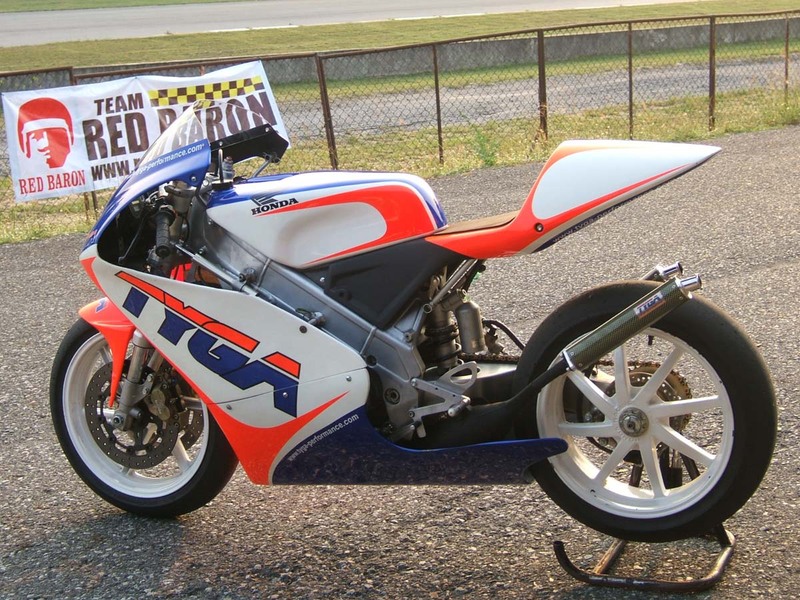 Even Honda have got in on the act with importing HRC prepped 600s for a Superstock class but I digress. 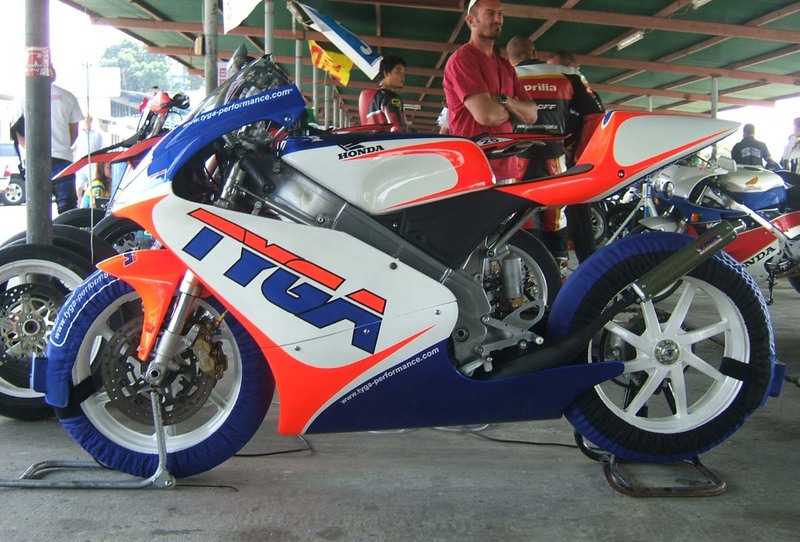 Here was a perfect opportunity to set up a David and Goliath coming together; this millennium's 1000cc 170 HP Ohlined, Bremboed, breathed on 170hp Superbikes versus a 1994 made for the job 250c two stroke 80 hp budget GP race bikes. If the contest was decided on budget, then we already had a clear advantage. I think our entire bike with its mods came in at about the same as one of the competition's bikes front brake system. Originally, we were going to prepare two bikes for Matt and Shane but with limited time we concentrated on one. 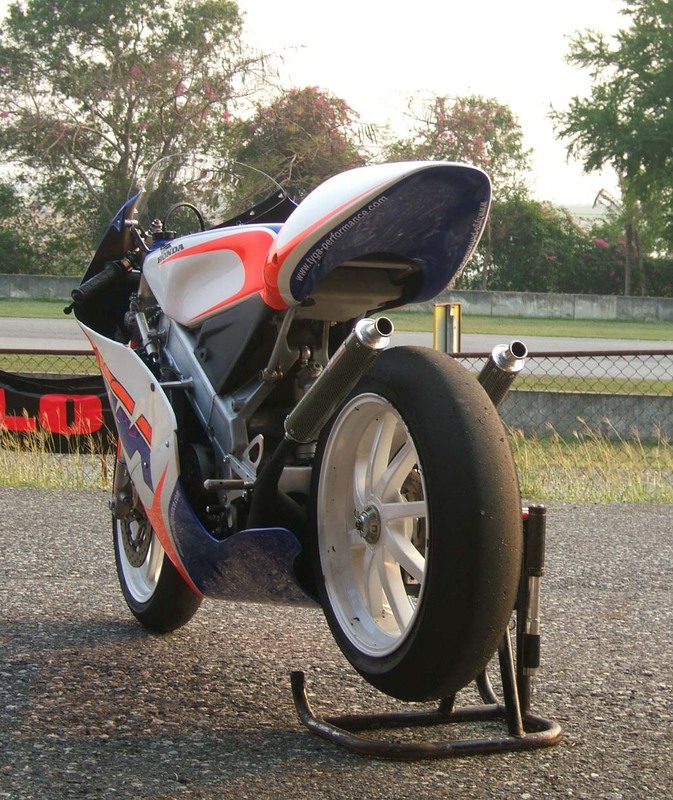 The bike we chose was the first of the two bought and features an aftermarket ram air system. Everywhere you look at the bike, you realise that this is no nonsense race bike with one purpose only in life and that is to win races. There is very little to it and only that which is needed to get round a closed road circuit in the quickest time. 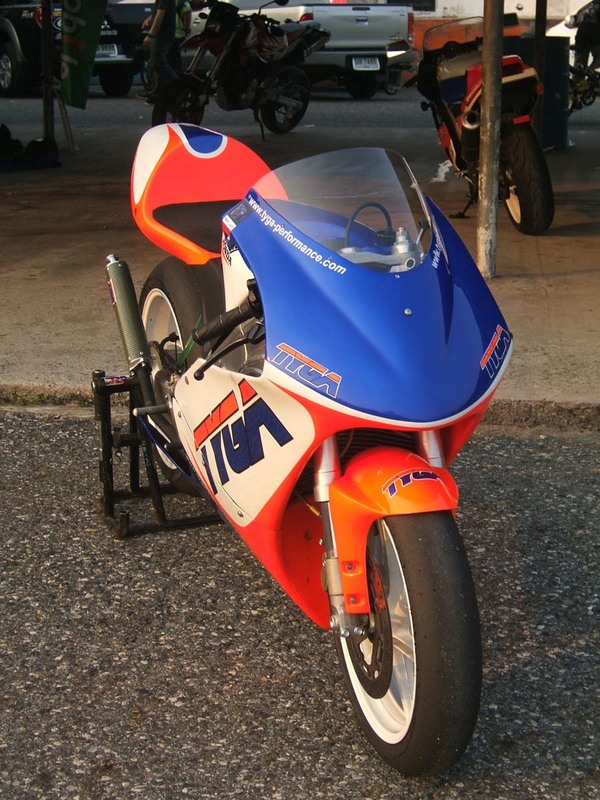 If you compare to say an NSR250, the thing that strikes you is how small yet how massive everything is. 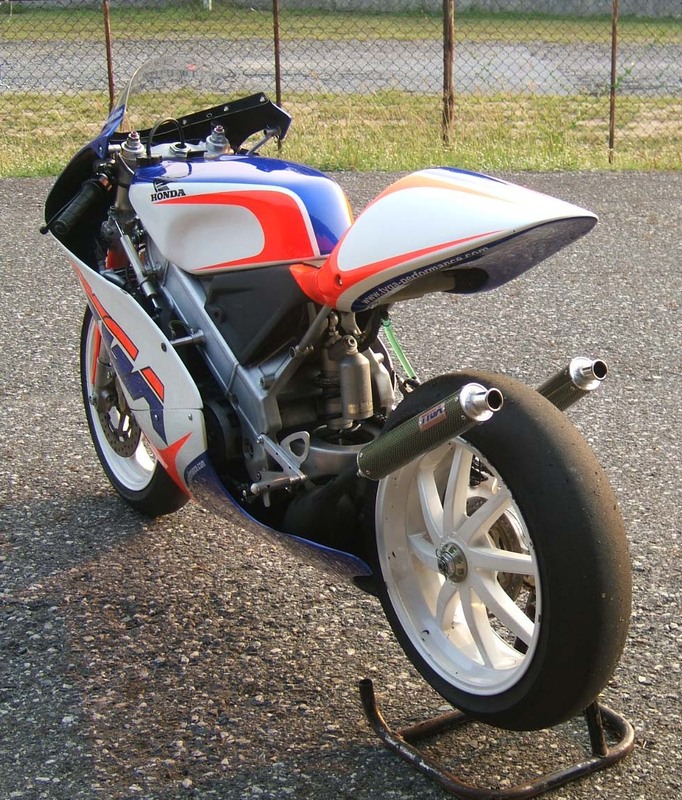 The frame, swing arm and rear wheel look like an MC28 on steroids but without the physical weight. The overall dimensions are tiny but very aggressive and very focused. There are no frills but there are no annoying things such as bottles and brackets to get in the way. Just he bare essentials. The stock specs are very impressive if you compare to a road bike. Brembo calipers and cast iron rotors, 41 mm lightweight upside down front suspension. Massive amounts of adjustability in suspension. Everything is lightweight such as aluminium subframe, meter stay and even top hat bushes. The aluminium fuel tank needs the quick release securing rubber strap to stop it floating away. 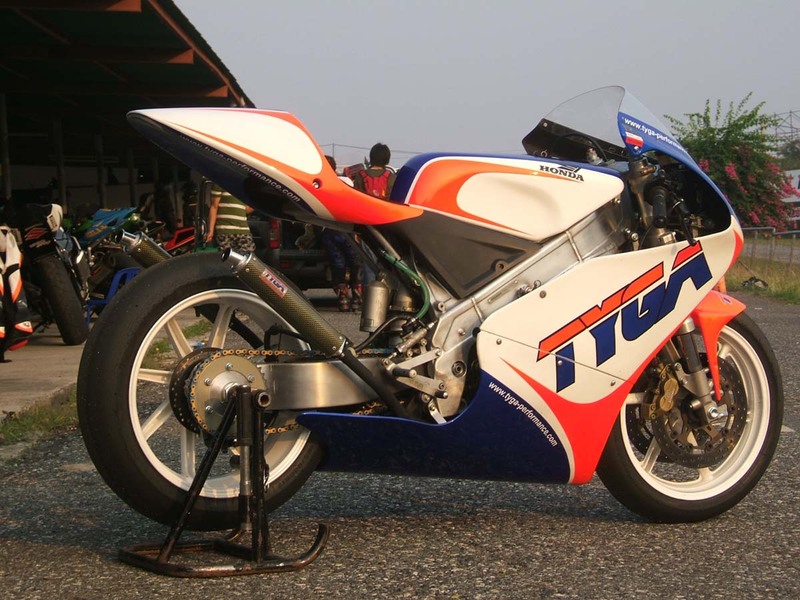 The wheels are of course magnesium alloy Magteks, but you'd know the difference between these and the NSR ones. Instrumentation is basic with one analogue rev counter and a digital temperature gauge which is pretty much all you need for an actual race. The bodywork is made from fibreglass and frankly speaking looked a mess. We didn't actually take any photos of it which was a shame but it made the bike look positively ancient. If we'd left it like that, the opposition would have been shocked that the old nail actually ran at all! 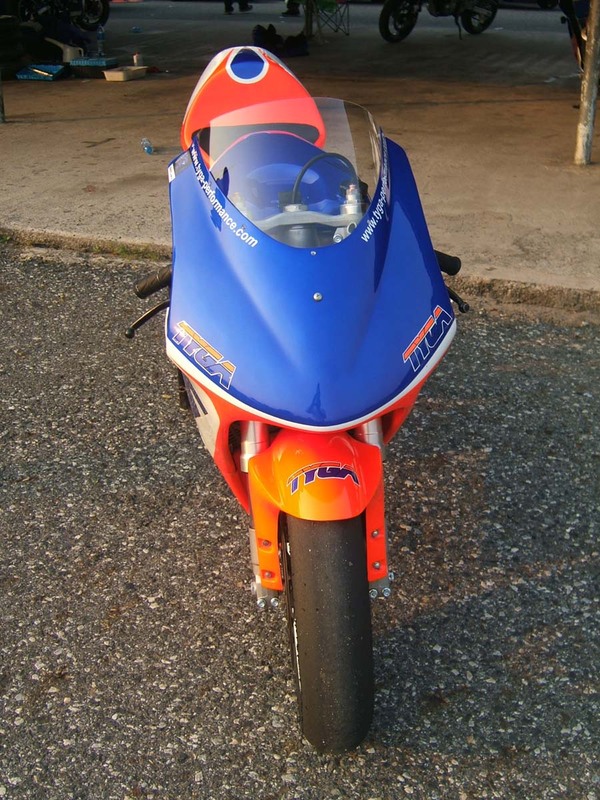 As we are a fairing company, obviously we couldn't let things stay as they were, so off with the original fairings and a new set of clothes. Actually, it had to make do with some cast offs from another model. 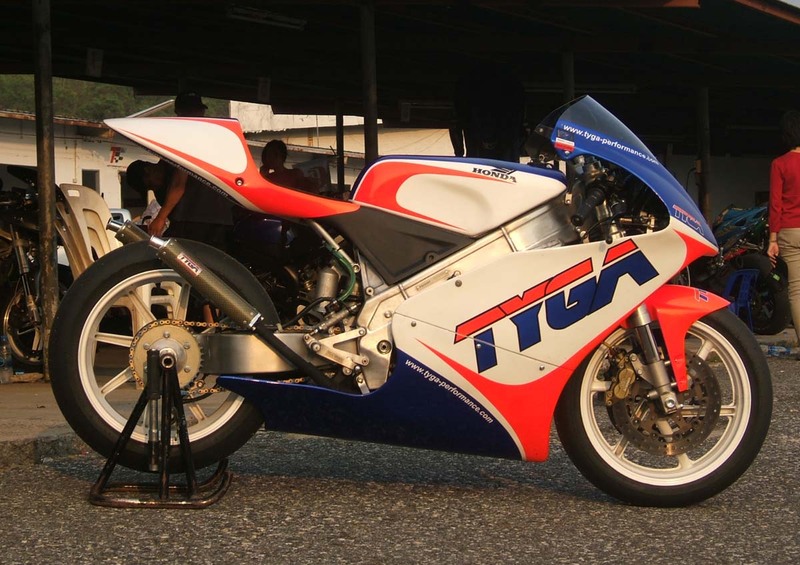 The seat cowling is a modified Tyga BPFT-9026 which is designed for the VJ22 RGV250. With a bit (ok a lot)of trimming, it fitted remarkably well and looked a lot neater than the coffin it was lugging before. 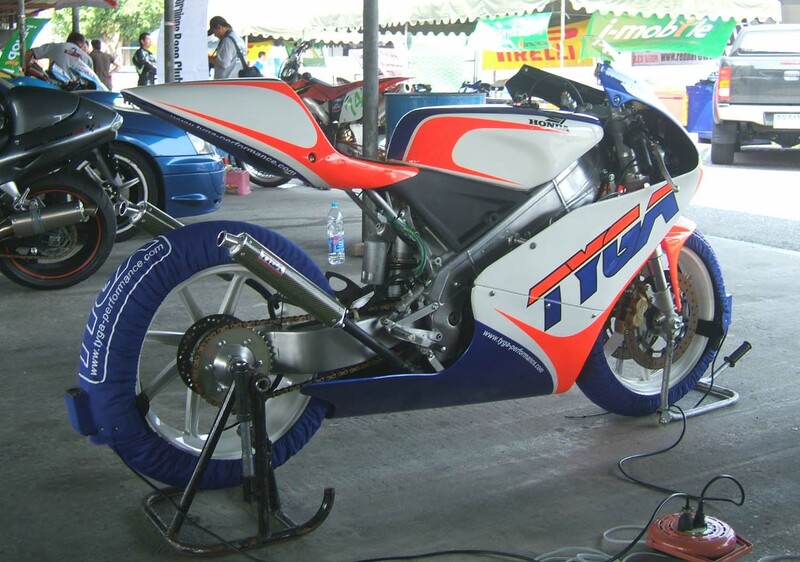 The fairing is a RS250RW one scrounged from the Sepang GP. The upper is from the 2005 Castrol team and the lowers are from Alex DeBon's 2004 model. Luckily they match, though a fair bit of cutting and shutting was in order before we got the fairings to fit neatly on the NX5. We made new upper stays and front fixing points to hang them from because the original ones were nowhere near. Next we stripped the bike down. The panels and tank were sent to the paint shop to get our familiar corporate colours applied. The fluorescent orange is a bit tricky to take photos of, but it does get you noticed at the circuit. Fading would be an issue but being a race bike it is only in the sun a few minutes at a time and there is a good chance the panels won't make it to the end of the year so not a big problem. We then set about the rest of the bike and stripped the bike down to every nut and bolt. 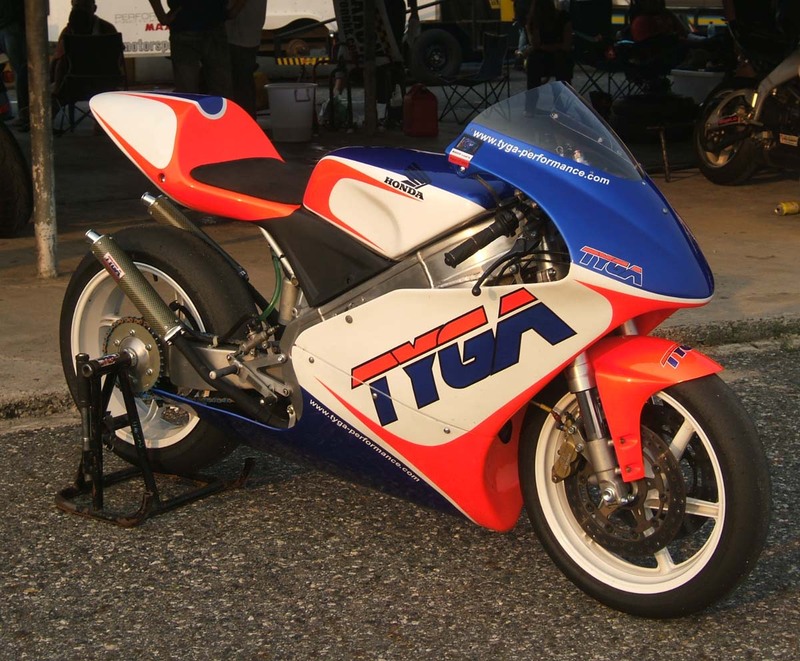 The engine needed rebuilding, not only had it seized at some point but there were too many unknowns for Matt and he needed the confidence of racing on an engine that he had personally prepared. While the bike was in bits, nearly all the nuts and bolts were cleaned and sent off for rezincing. 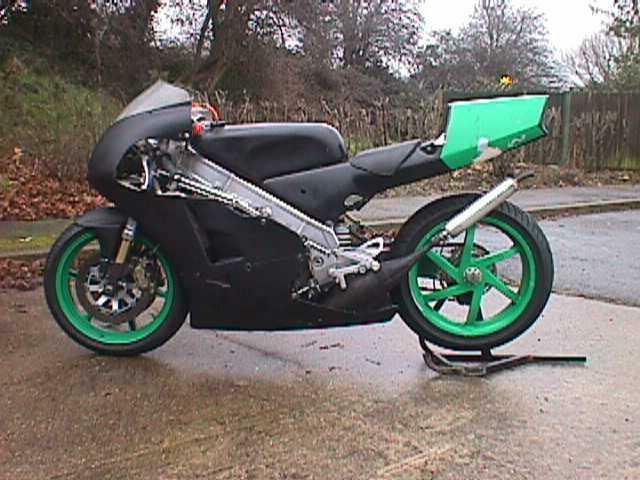 The forks were rebuilt as well as the rear suspension and swing arm linkages. The frame and swing arm had been half heartedly polished at some point and still had rough casting showing through. I set to the swing arm with wet and dry starting at 180. before I got to the underside I noticed I was bleeding and then realised I had actually worn a patch of skin away on one of my fingers, so with insufficient time to get a skin graft finished off with a drill and scotchbright attachment. The frame Matt kindly prepared. Despite what most people imagine, we actually have office jobs and the RS had to fit in around the other more urgent tasks of running a business, work being done at weekends and evenings. Before we knew it, the track day was looming and although we had the paintwork back, all the parts to be zinced were still not ready. It was Wednesday and the track day was Saturday. 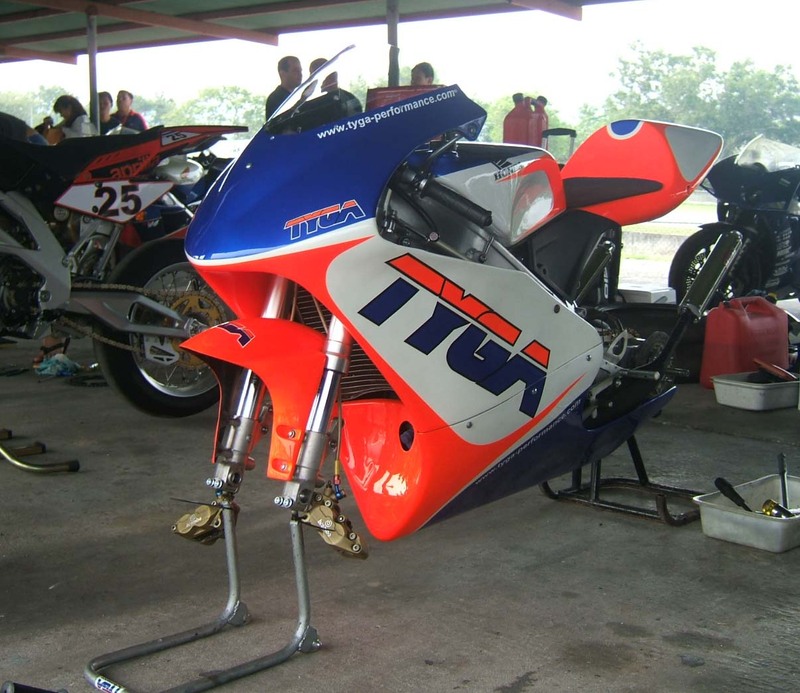 The bike had only been started once two years ago, was running a fresh top end which needed to be run in, the bodywork we still hadn't made all the stays for and we were still missing the parts at the plating shop! Some of these eventually showed up on Thursday and we worked in the evening until 2 am getting what we could ready. The rest arrived on Friday afternoon and we again had a late night fabricating brackets until the wee hours by which time the bike was all together except for a fresh set of tyres. 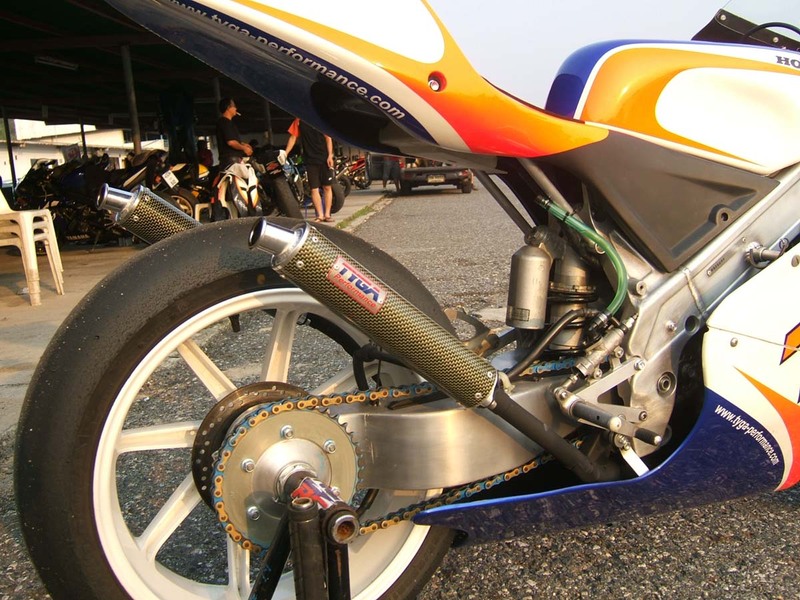 We added a few of our products for good measure such as our carbon/Kevlar silencers, the carbon front brake reservoir pot, and a new HRC rear brake reservoir kit and radiator overflow bottle. A bit late to run some heat cycles into the engine in a residential neighbourhood so we called it a night/morning. So on Saturday morning after a solid 3 hours sleep, the bike was hauled up to the circuit in Matt's pickup. Fresh(but not new) bags were put on and the bike run in. Everything went without a hitch and the bike was fighting fit by mid morning. The pits rapidly filled up and there was another good attendance. The opposition fierce but Matt's lap times were impressive. In no time he was lapping at 1.08s and even 1.07s. 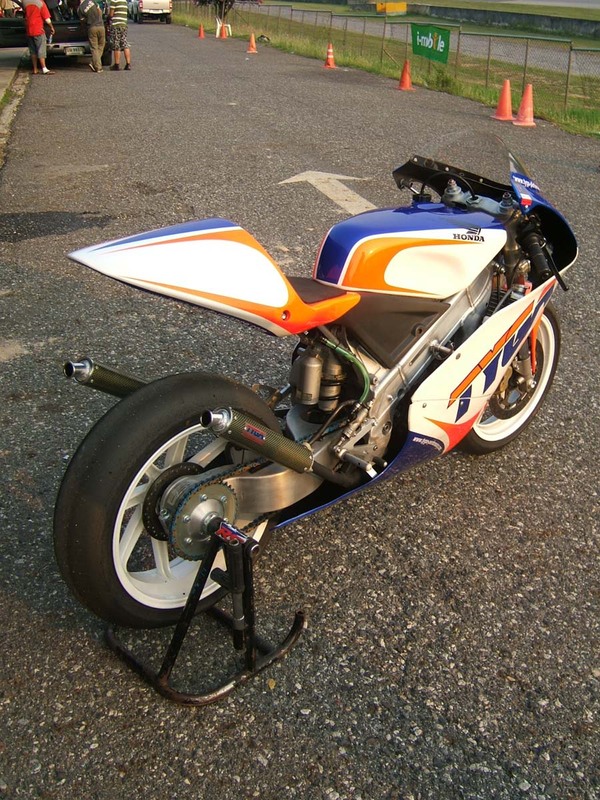 Only Superbird (Ex World Super bike rider and points scorer) was matching them on a tricked up 2007 CBR1000RR. In the afternoon, there was scheduled to be races in three groups, beginner, intermediate and advanced. 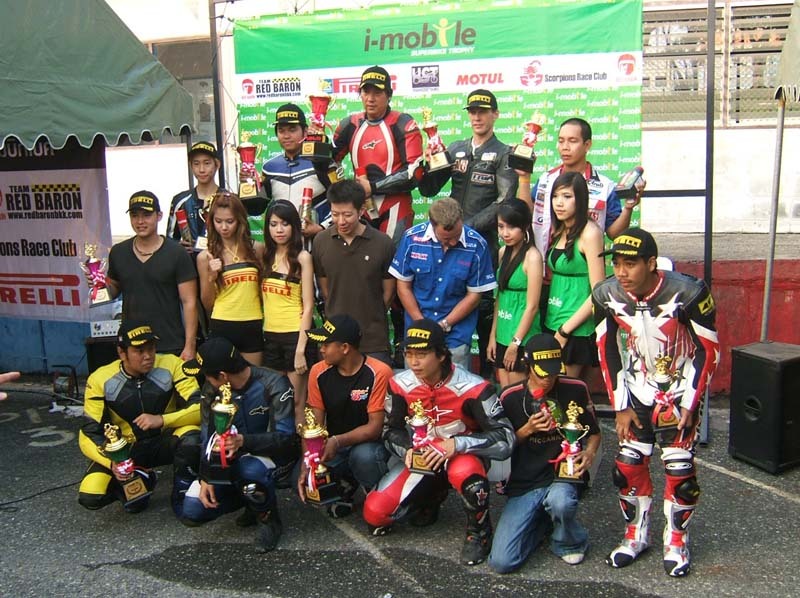 Matt was obviously in the advanced group which was a grid of mostly 1000cc Japanese Superbikes. 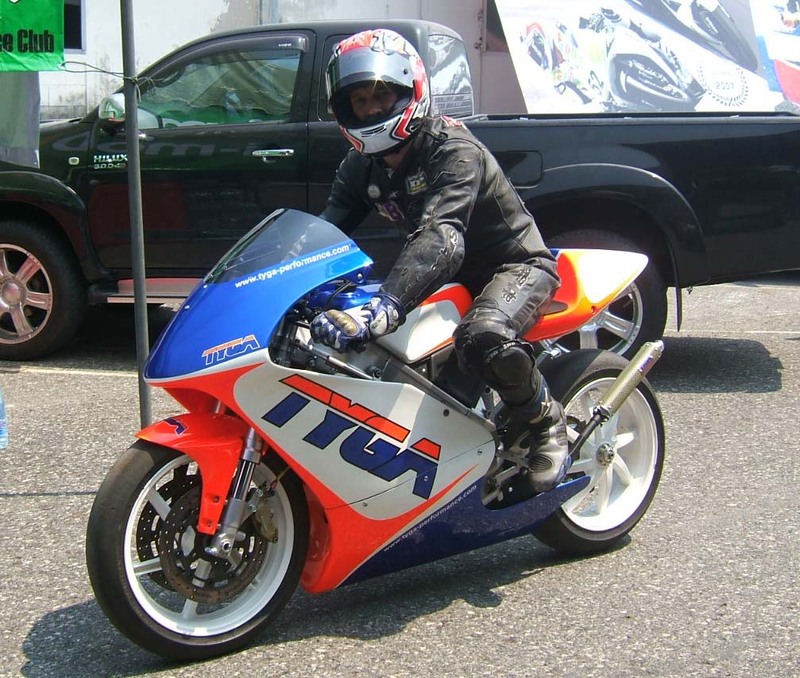 As well as Bird, there were a few other riders with racecraft and experience. 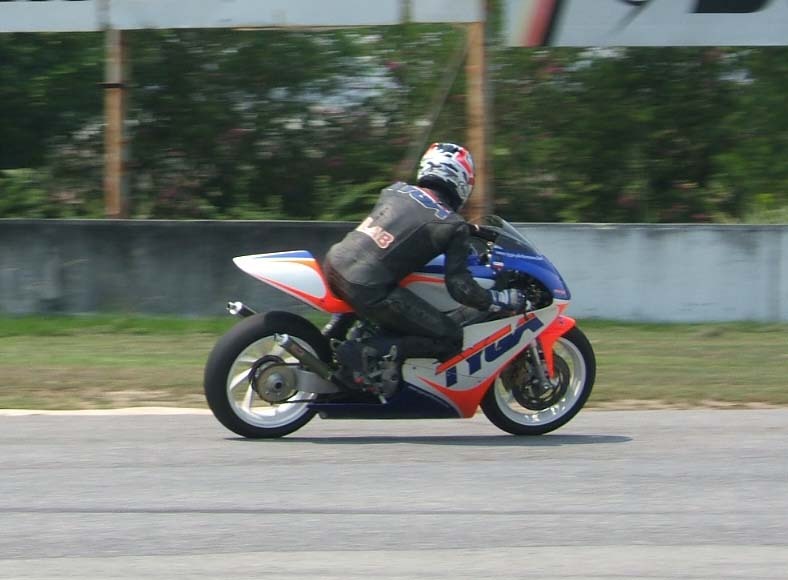 Not an easy task to take on, let alone beat bikes with a 80 horsepower disadvantage especially at the start. It was tiring work putting the bike together, so when it fired for the first time on Saturday morning both Paul and I were well chuffed. It sounded pretty fat on the stand, but figured we'd heat cycle it and just give it a go in the first session. It ran ok, but wouldn't take full throttle down the straight. Obviously rich, so adjustments were made to the carb settings. The next session went well. Still a tad rich, but decided on keeping this setting to preserve the engine (limited spares). Pitted a couple of times for suspension twiddling and soon it was handling pretty sweet. I'd set a reasonable lap time, so was quite happy. Come the race we had to start by drawing grid positions from a hat. I picked 8th, which was rather disappointing. Still, must keep a stiff upper lip and just get on with the job. 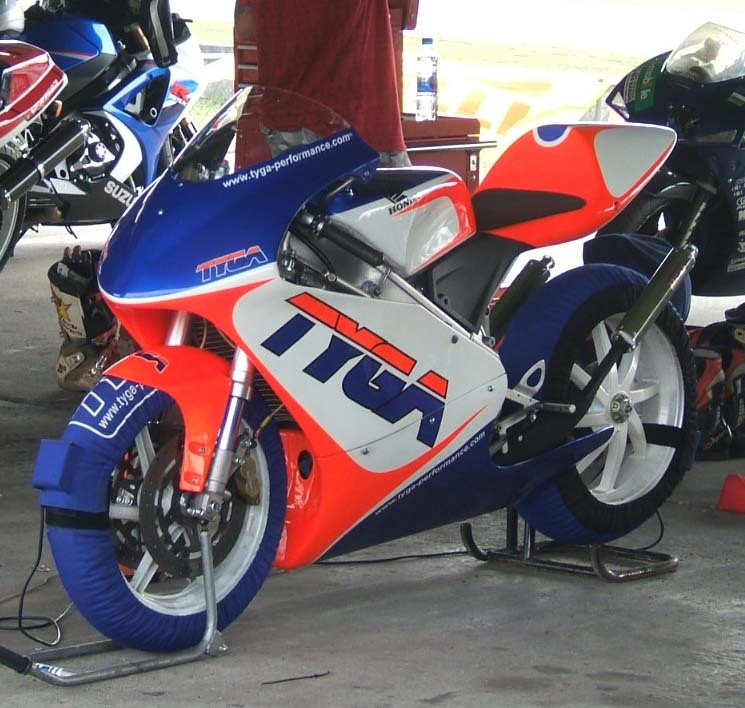 A practice start on the warm up lap went ok, but I knew that the litre bikes will always stomp a tiddler two stroke off the line. So the start proper; dropped the clutch and away we went, bogged a bit but then got going again. I was 7th into the first turn. I knew that I was going to have to rely on corner speed to beat the boilers, but the trouble is that they tend to stop, turn and squirt out the turns, so you come flying into the bend on the 250 only to find a GSXR1000 parked there. I can remember at least half a dozen close encounters where I needed to stand the bike up to avoid running up the chuff of the bike ahead. Then of course you lose all momentum and have to start dancing on the gears to get the thing going again. I picked my way up to 5th, then showed matey (in 4th) my front wheel a couple of times and sure enough he out braked himself and took a trip into the weeds. I quickly caught up to third place and tried the same attack plan, but he was a little more focused and continually shut me out and then blitzed me down the straight. I made it past a couple of time only to get wasted again out of the corner. By this time I was making a couple of mistakes here and there due to frustration so tried to settle back in. Come the final lap I knew that the pass was imminent. I was making good time at the fastest turn on the track (100mph knee on the floor) so I lined 3rd place up and just stuffed it underneath him through the apex. He came by me again up the hill, but there's no way a 1000cc heavyweight can out brake a skinny 250 GP bike into an 80mph chicane, so I waited til he braked, then went round the outside of him and into third place. I kept my head down as I knew that the run to the line would favour the boiler, but we had another chicane, a first gear corner and a fast third gear sweeper to go so I figured I could block him as necessary. My plan worked and I crossed the line in third, actually not too far behind second. 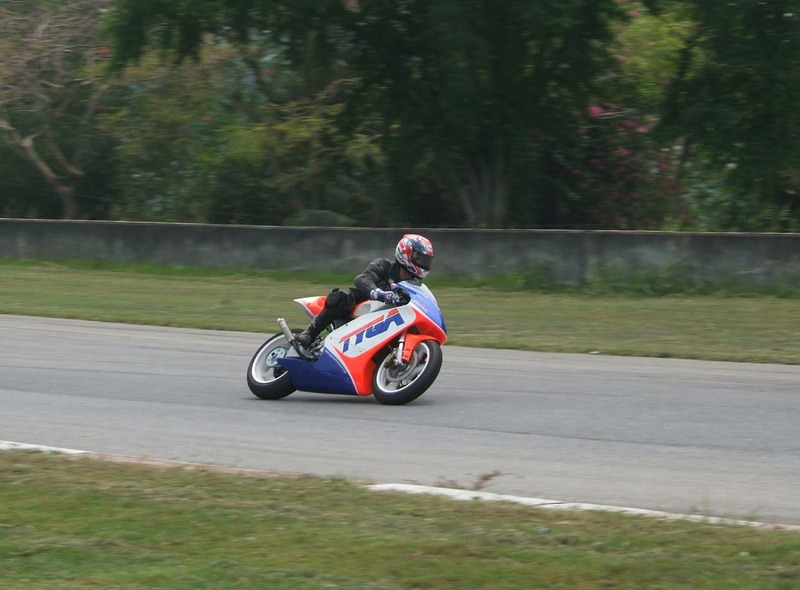 Superbird took the victory on a CBR1000. I was pretty worn out at the end of the day. 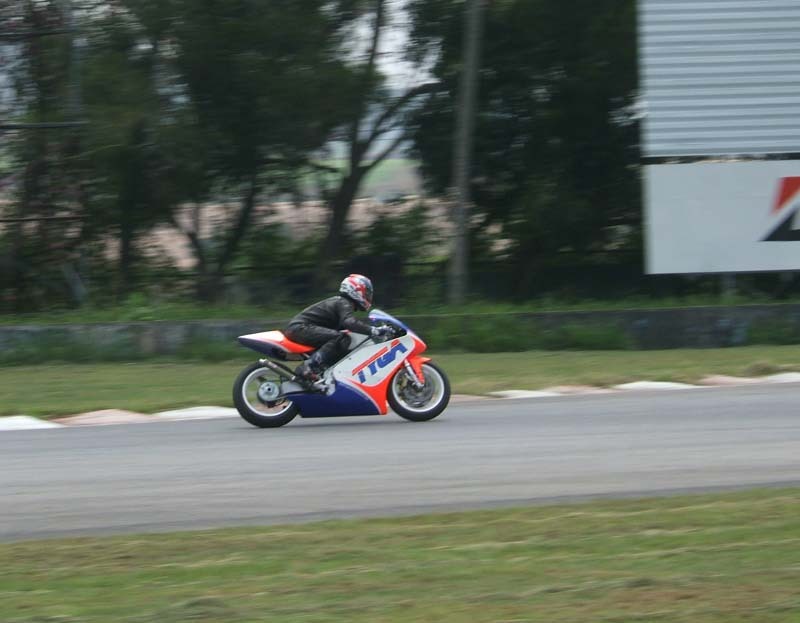 Not so much from riding the sweet little stroker, but more from the lack of sleep preparing it! Next time with a proper night's kip, new tyres and a bit more setting up time I think we'll be fighting for the win. So, the day went exceptionally well. We didn't get the perfect result we had hoped for but I think given the circumstances (arriving on a 250 which hadn't even been started against a grid of Superbikes) we went away pretty pleased with ourselves and very pleased with the RS250s performance. 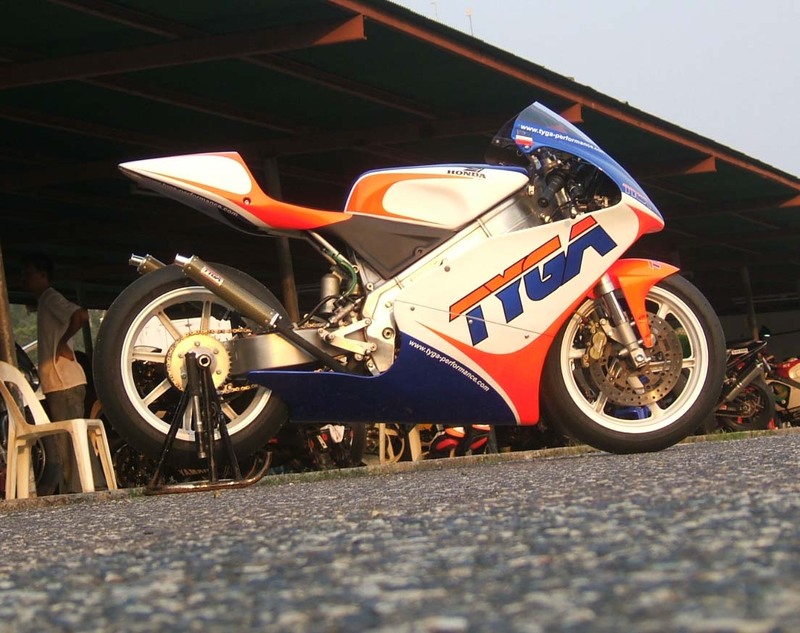 Our bike got plenty of attention as well as performed well and although we are biased, looked the trickest in the paddock. It certainly stood out from the crowd. There are always ways to improve and there will be another chance. Will Matt take the win, that is not so easy to say and only time will tell. In the meantime, we've got another NX5 to prepare for Shane so plenty to do and lots to look forward to. Modifications between now and the next track attack are chassis setup, a possible switch to race fuel, and Matt's already chatted with Ratthapark Wilairoj's dad about some bits and bobs filtering through to us! 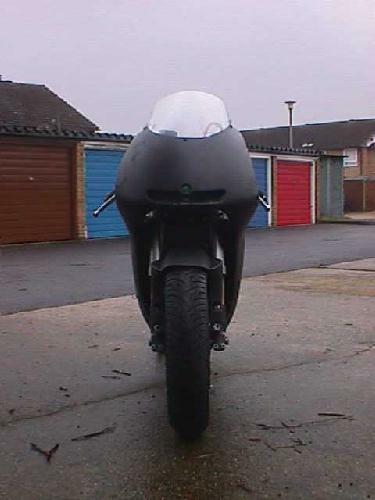 Below are comparison shots between a 1995 NX5 fitted with 1996 bodywork and our bike. 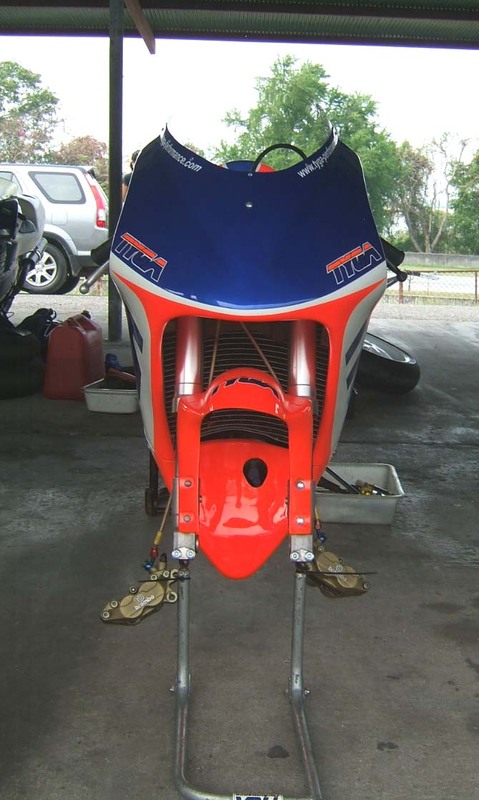 Seat Cowling, GRP, VJ22, GP Style, Assy.